Pithecellobium sp. has complex compound leaves, each with an axillary bud (arrow) directly above on the stem. 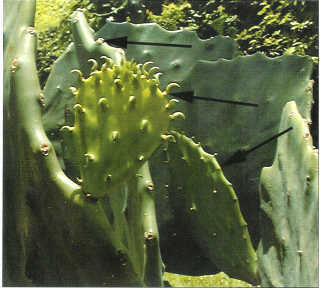 A young pad (= branch) of an almost spineless form of Opuntia has small green leaves below axillary buds (arrows). These tiny leaves soon fall off. With a little training, most plant enthusiasts have little problem distinguishing leaves from branches. Leaves are basically flat and usually green. Leaves are borne on cylindrical stems that form twigs or branches in trees and shrubs. With few exceptions, each leaf is associated with a small bud, found in the crotch between the leaf and the stem (called the leaf axil). This axillary bud can later grow out as a new branch or as a flower. Some leaves are more complex and form elaborate compound leaves with many leaflets. Think of the feathery leaves of royal poinciana or coconut. Here again, the leaf has an axillary bud directly above its attachment to the stem; the leaflets lack buds where they attach to the leaf axis. A hand lens may help to see this feature, but it is clear cut. Leaves, whether large or small, almost never carry buds, flowers or fruits. Leaves grow out in one flush and then stop growth, unlike branches which can grow throughout a season and produce a series of new leaves and axillary buds. These flat green organs that grow from an axillary bud on the stem of Phyllanthus epiphylanthus are modified branches and carry axillary flower buds (arrows) above tiny scale leaves on their edges. Of course, the uninitiated may be fooled by some examples of “look-alikes” (often illustrated in botany textbooks). The green pads of Opuntia cactus are really flattened stems. The true cactus leaves are the spines that occur in clusters. Each spine cluster is, in fact, a short compact branch. Another example of a flattened green branch that carries many small flowers occurs in Phyllanthus epiphyllanthus, a native to the Bahamas. Its true leaves are tiny scales below each flower and below its leaflike branch, in other words, each scale leaf has an axillary bud that grows into a flower or flattened branch. 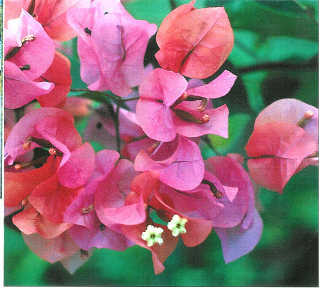 In Bougainvillea a leaf, here modified as a brightly colored bract, is fused with a flower bud as part of the showy flower cluster. Compound Leaf or Simple Branch? Cananga odorata, the ylang-ylang tree, has long thin branches that look like compound leaves, but note where the axillary buds are located (arrows). We realize how intriguing Nature can be when we find branches that appear to be compound leaves. Coffee and its relatives in the Rubiaceae can have short lateral branches with pairs of simple leaves. If examined superficially, these branches look very much like the compound leaves of a legume or bignon, e.g., the ylang-ylang. However, each of the leaves has its own axillary bud; the compound leaf only has one bud at its base. The giant leaf of Chisocheton macrantha is native to Borneo. 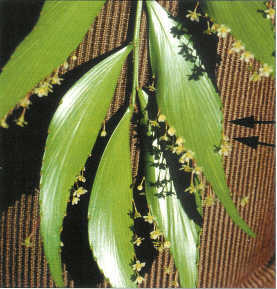 Leaflets grow from an unusual leaf tip bud (arrow). A very odd example is found in some members of the mahogany family (Meliaceae). Botanists have long argued whether two genera, Guarea (in tropical America and Africa) and Chisocheton (southeast Asia), have branch1ike leaves or leaflike branches. I too have become fascinated by this question and drawn into the scientific debate. Over the last 15 years, I've collected examples of these “leaves” in the rainforests of the Caribbean, Malaysia and New Guinea. At Fairchild Tropical Botanic Garden we grew seedlings, experimented with trees growing in our rainforest exhibit, and examined their microscopic structure. 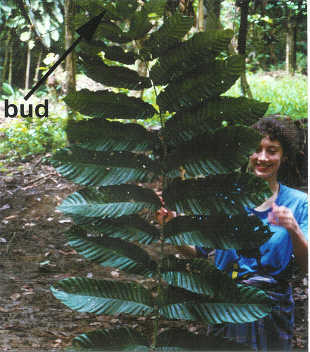 In Puerto Rico, Guarea guidonia produces a flush of new leaflets from its leaf tip bud (arrow), a very unusual feature for leaves. What I concluded (as detailed in a recent technical paper, Fisher, J. B. 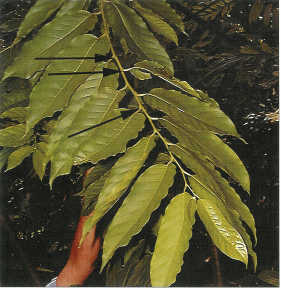 2002 Botanical Journal of the Linnean Society 138:207-221) was that the “leaves” of Guarea and Chisocheton are indeed unusual in that they continue to elongate and produce new leaflets for several years from a leaf-tip bud (indicating branchlike behavior). But these “leaves” have the internal structure and development that are identical to the more typical leaves of other related mahoganies. The details of embryonic development, growth, and internal anatomy of the leaf-tip bud are all clearly leaflike. I concluded that each is truly a leaf, but retains the immature stages of a single leaf for far longer than is common. This unique feature results in a branchlike appearance. Why such branchlike leaves occur in only two genera among all flowering plants remains a mystery. These and other variations from the “typical” leaf or branch abound among tropical plants, are further indications of the vast and fascinating diversity that awaits discovery in the tropics.